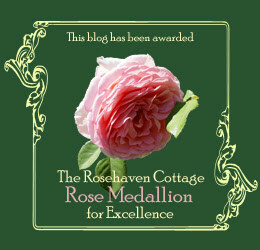 The "Rose Medallion" is given by us at Rosehaven Cottage to blogs that we find to be of exceptional merit in design and content. The blogs given this honor are those that we have found particular enjoyment, inspiration, and/or insight(s) in reading--blogs that have exhibited a passion for living. We hope that the "Rose Medallion" recipients this week will be pleased to display it on their blogs. Lynda is a multi-faceted artist whose work (which she features on her blog) offers a vibrancy as well a sense of inner strength and serenity. Take time and browse. You'll be glad you did! We guarantee you'll walk away with some inspiration to create something. We did! Featuring the adorable and lovable kitty cat Miss Peach, this blog is a must-read for us on a daily basis. The photography and art (not all "kitty related) is a true joy to view. Many times there is a gem of poetry that makes us come away with a lightness of heart that only really lovely writing can induce. This blog is a real favorite of ours simply because of the passion for gardening that is expressed there. The photographs are lovely, regardless of whether one has a green thumb or a brown one. Covering quilting, cats, roses, and life in general, this blog is a wonderful example of what living life with passion encompasses. Oh my, I am deeply honored to be selected for this beautiful medallion. It will be proudly displayed on my blog this special VICTORIA homecoming month. Is this rose the EDEN? She is my favorite and climbs over my front arborgate. if I had to chose just one rose to have in my garden, it would be EDEN.